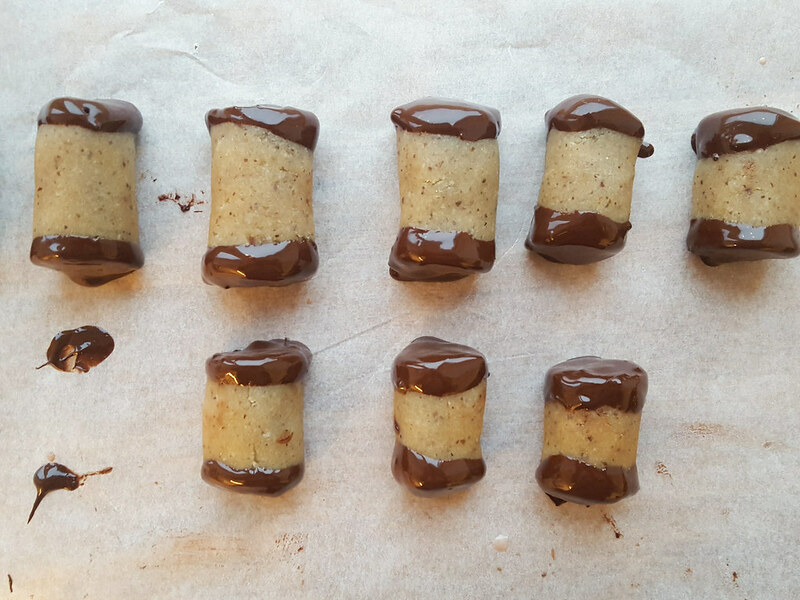 This recipe I am sharing here on this page is a healthy, sugar- and flour less alternative to the traditional Danish treat called ‘Tree Logs‘. The traditional Danish tree logs are very popular and can be bought at every bakery in Denmark. The original tree logs have a moist inner core made of chocolate cake, wrapped in a thin layer of marzipan and finally the two ends are coated in dark chocolate. 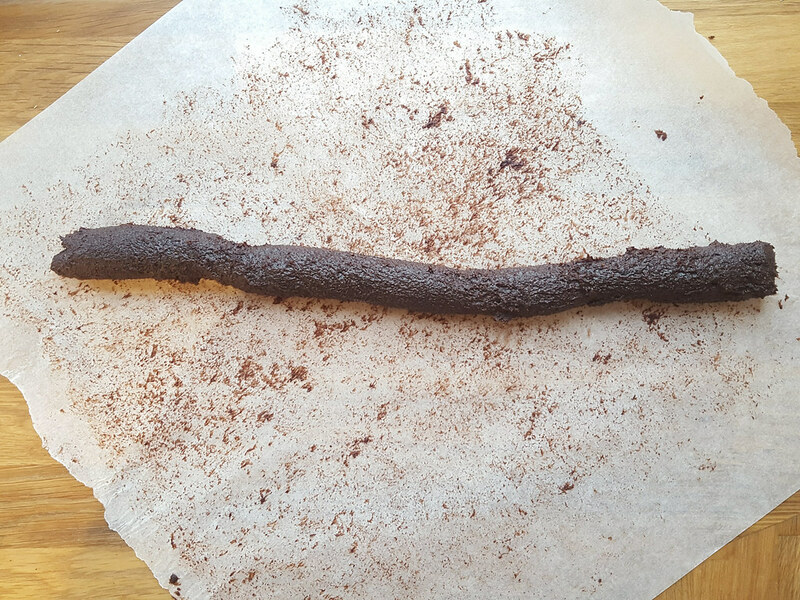 If you are looking for the traditional and original recipe for Danish tree logs, you can find it in the cake section on my blog. As said above, this recipe I have listed below is a healthy alternative to the original recipe. You might think that a healthy alternative to a traditional cake is a stupid idea. However, this is not true for this particular recipe. 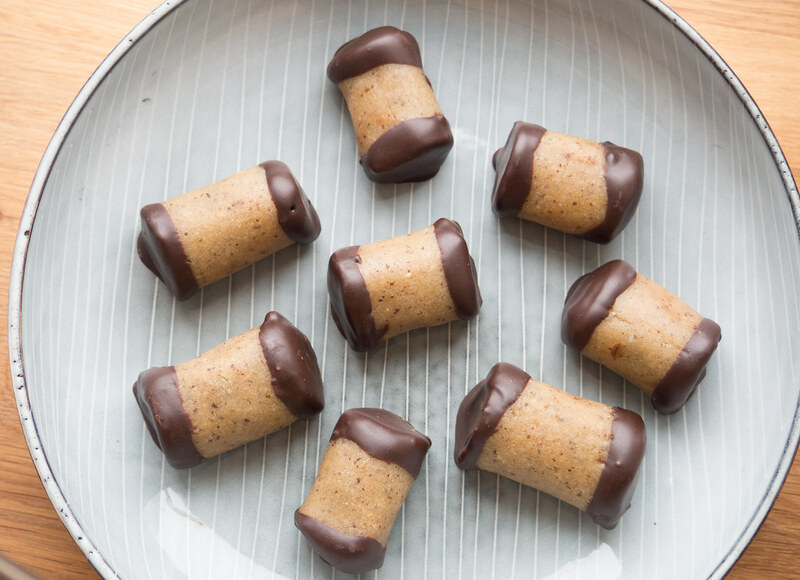 I personally think these sugar- and flour less Danish treats are super delicious and just as good as the original recipe which uses plenty of sugar, flour and butter. If these small ‘cakes’ do not consist of sugar, flour or butter – what is the secret then? That is answered easily – these cakes is based on the three and simple ingredients; Pecan nuts, cocoa powder and dates. The nuts and the dates gives the texture and sweetness to the cakes and the cocoa gives the delicious chocolate flavor. The marzipan used to wrap around these cakes is made from the two only ingredients; skinned almonds and dates – very basis and super easy to make. 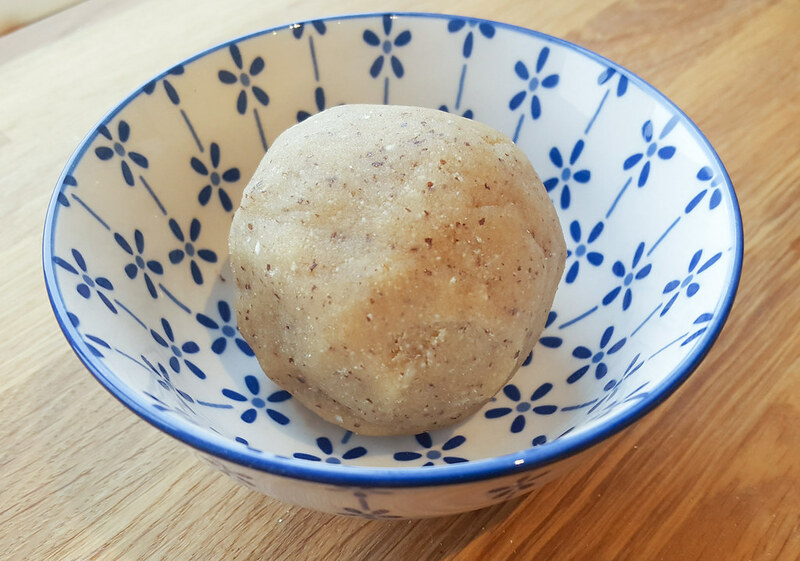 A traditional marzipan is made with plenty of sugar, in this recipe we uses the natural sugar content from the dates. Of course, it is not completely true when I saying these cakes do not contain any sugar. 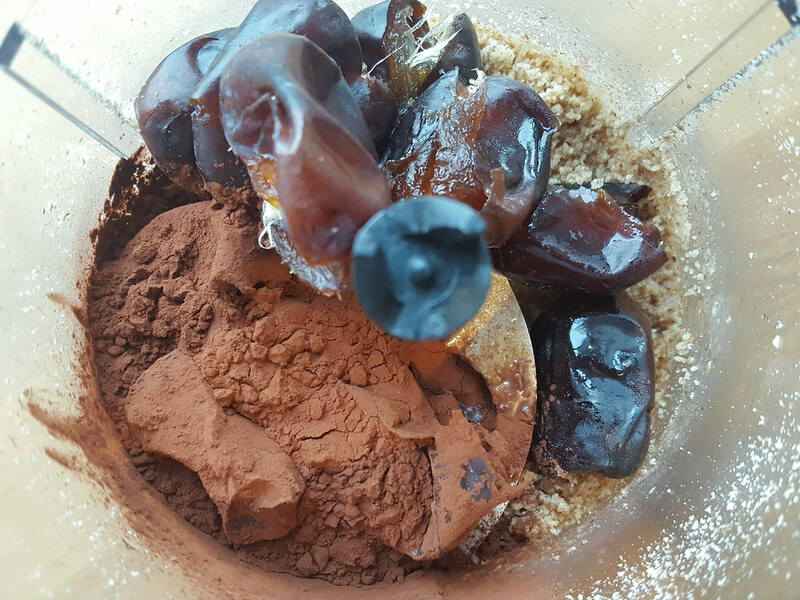 Especially, the dates have a natural sugar content and the dark chocolate used to coat the two ends also consist of some sugar. However, compared to a traditional cake the sugar content does almost not exist. Besides being a delicious, a good tasting and good on your conscience – these cakes are also super easy to make. 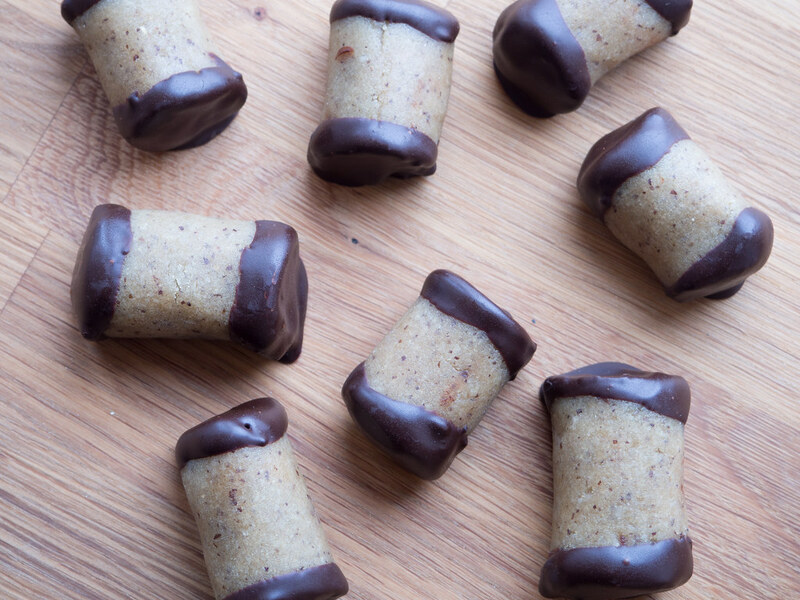 You start by making the marzipan by blending skinned almonds and a date. I always use my mini blender. When blended into a uniform marzipan dough, keep it in the fridge while preparing the chocolate part of these cakes. 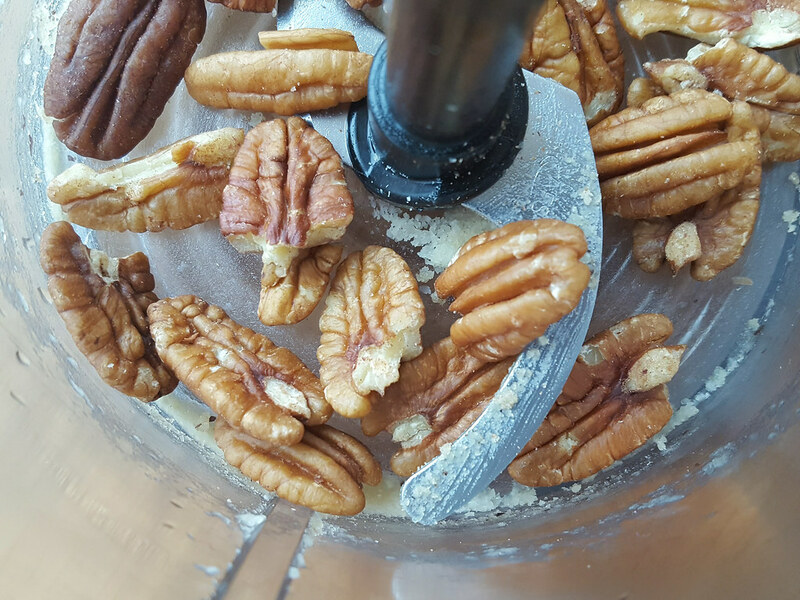 In the same mini blender, blend dates, Pecan nuts and cocoa powder together into a sticky dough. Refrigerate the dough for about 15 minutes to let the dough become a bit more firm. Sometimes, it needs a bit more time in the fridge depending on the fresh- and moistness if the dates. 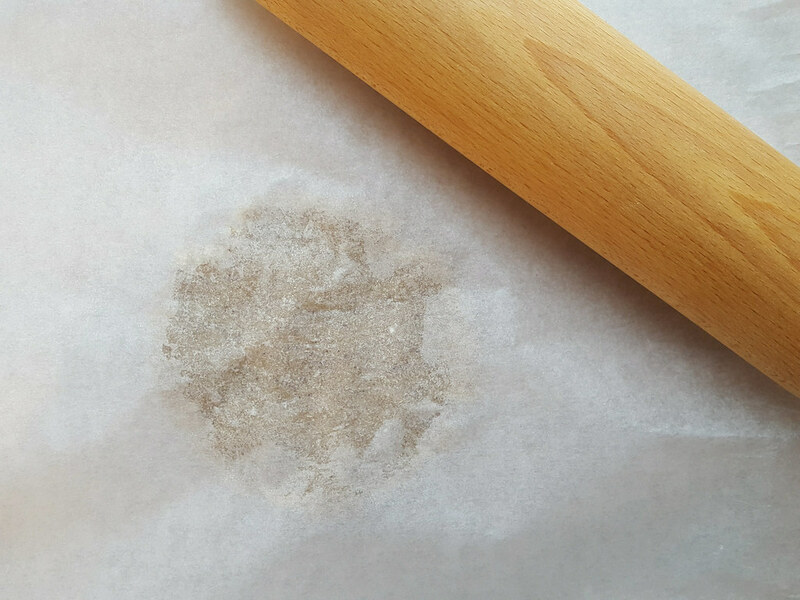 Using a rolling pin; roll out the marzipan into a square sheet. 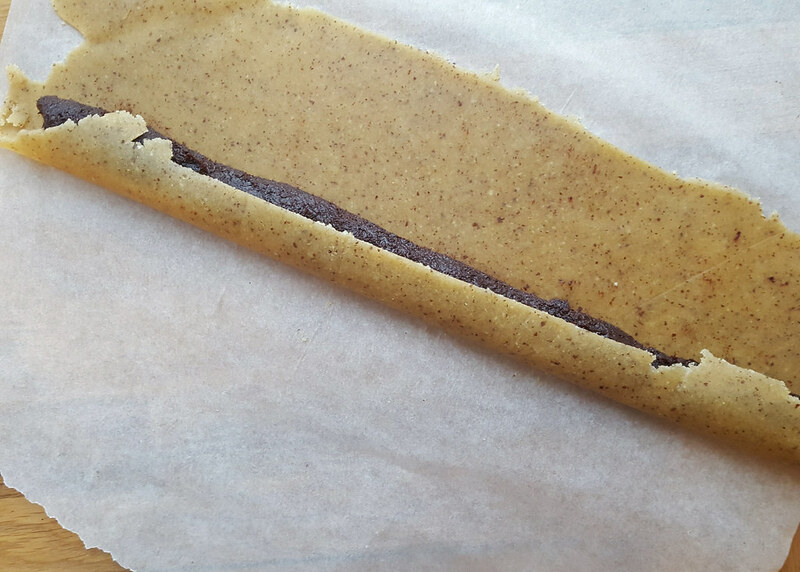 Roll the chocolate dough into a long ‘sausage’ and place on the marzipan. Gently, wrap the marzipan around the chocolate. Cut the cake into small pieces and dip each end of the small cakes in liquid and dark chocolate. 1. Start by making a marzipan; in a small bowl, cover the almonds (with skin) with very hot water. Set aside for 8-10 minutes. 2. When the almonds have soaked in the hot water for some time; remove the skin by squeezing the almonds in between two fingers. The skin should come of very easily. If the skin is hard to remove let them soak in some hotter water for some extra time. 3. 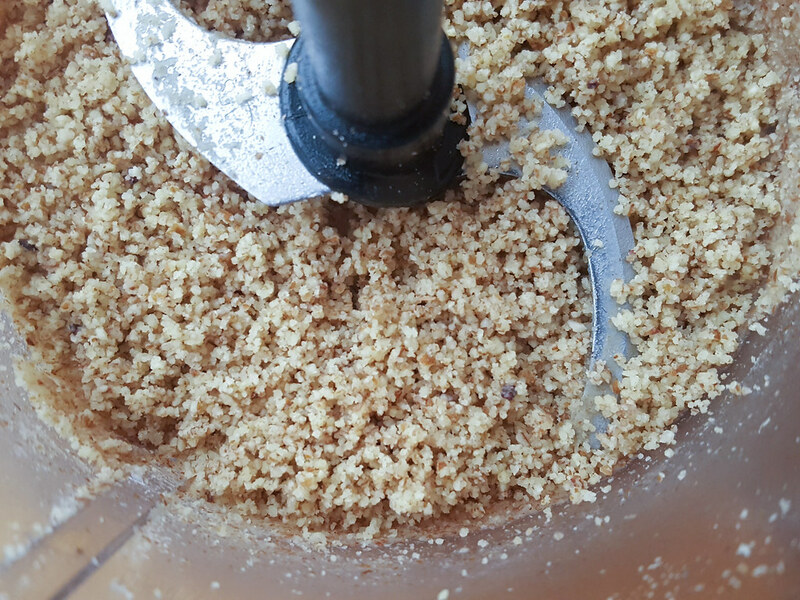 Pour the almonds into a food processor and run on high speed until the almonds are tuned into almond flour. 4. 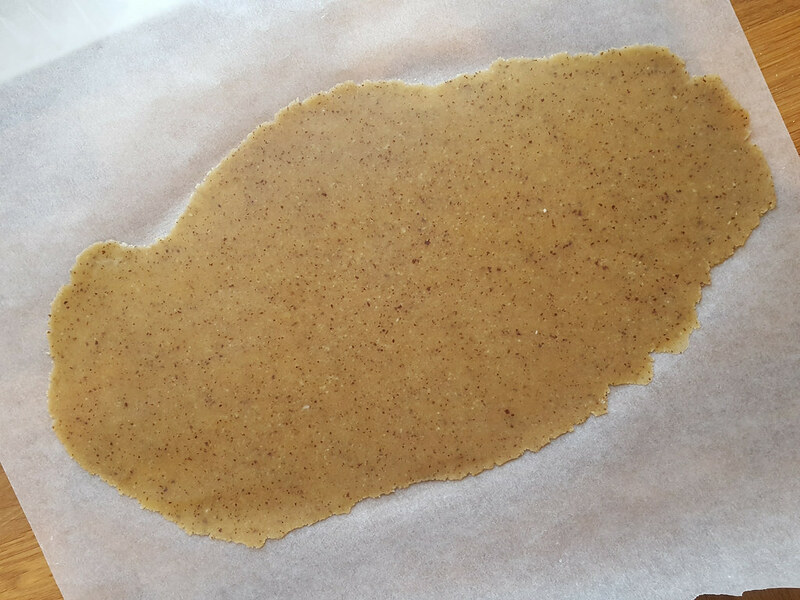 Add the three seedless dates and blend for another couple of minutes or until the marzipan is turned into a sticky dough. Depending on the freshness of the dates, sometimes it is necessary to add 1 tablespoon of water. 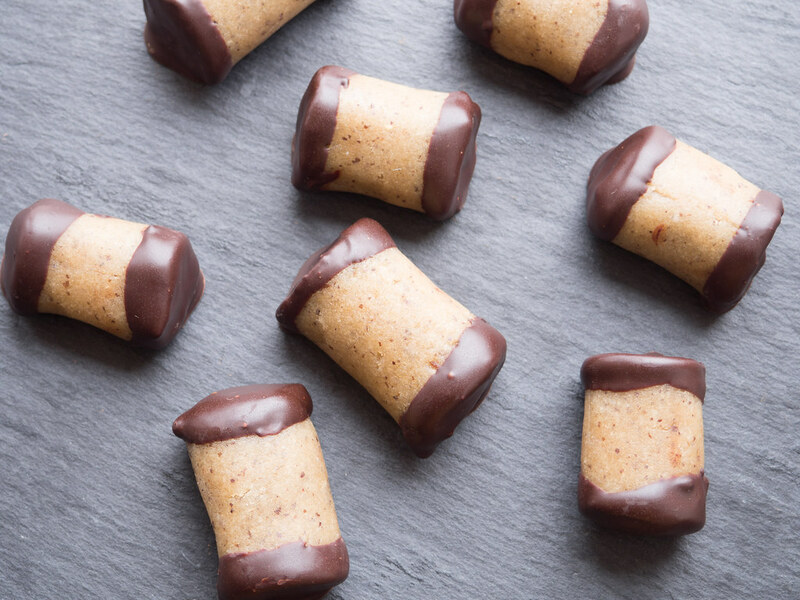 Keep the marzipan in the fridge while preparing the chocolate filling. 5. 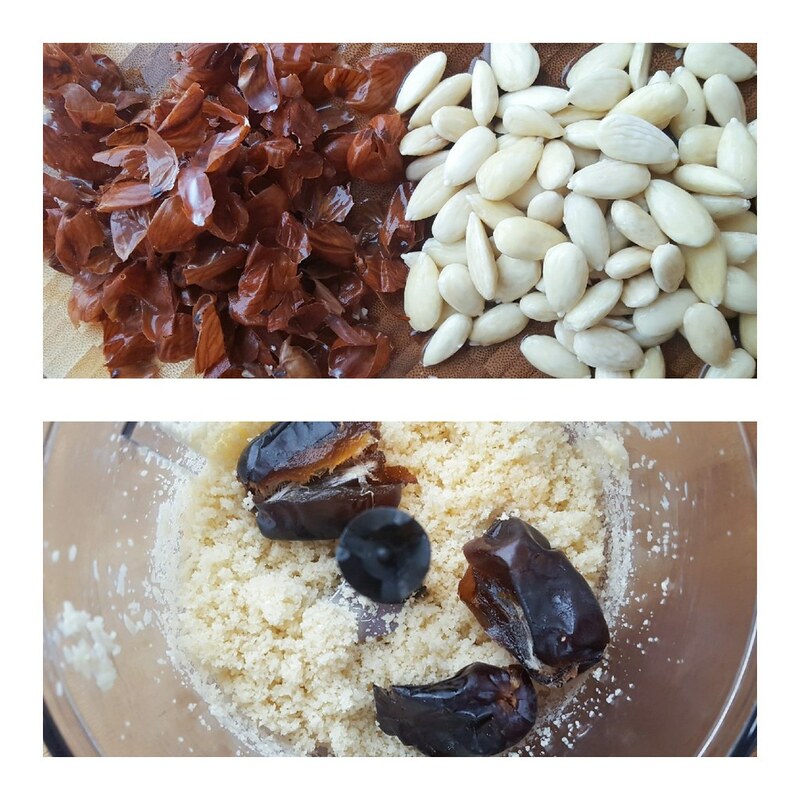 In a food processor; blend the nuts into a flour. 6. 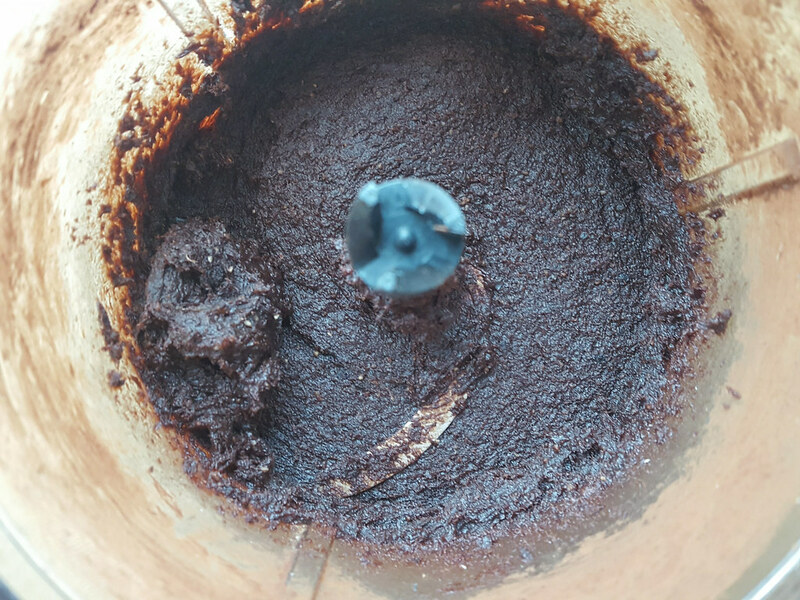 Then add the dates, cocoa powder and rum essence. Blend everything until the ingredients are turned into a uniform sticky cocoa dough. Add some extra rum essence if you prefer a richer rum flavor. 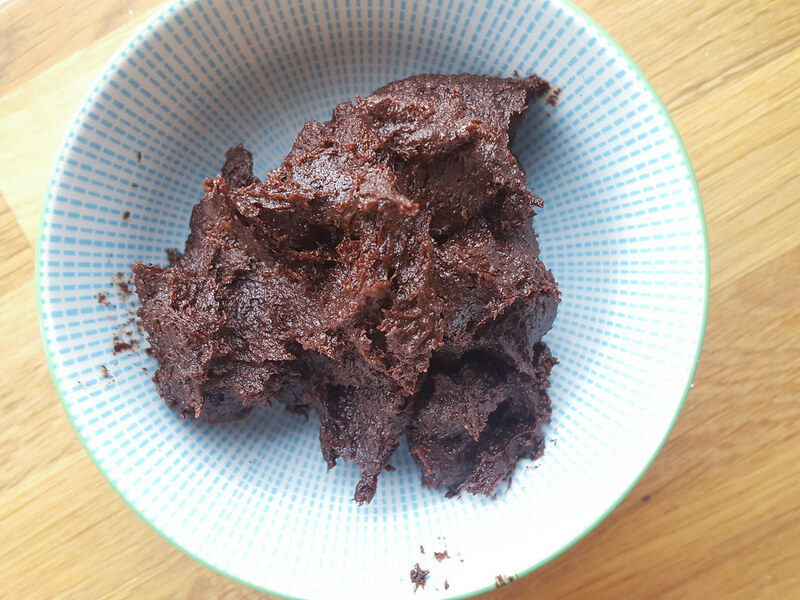 Set the cocoa dough aside in the fridge for about 15 minutes. 7. 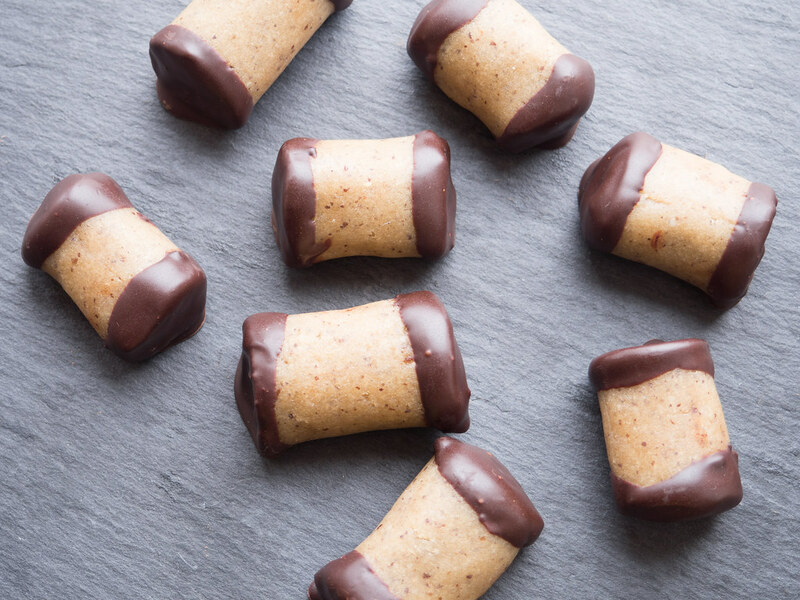 While the cocoa dough is settling in the fridge; prepare the marzipan. 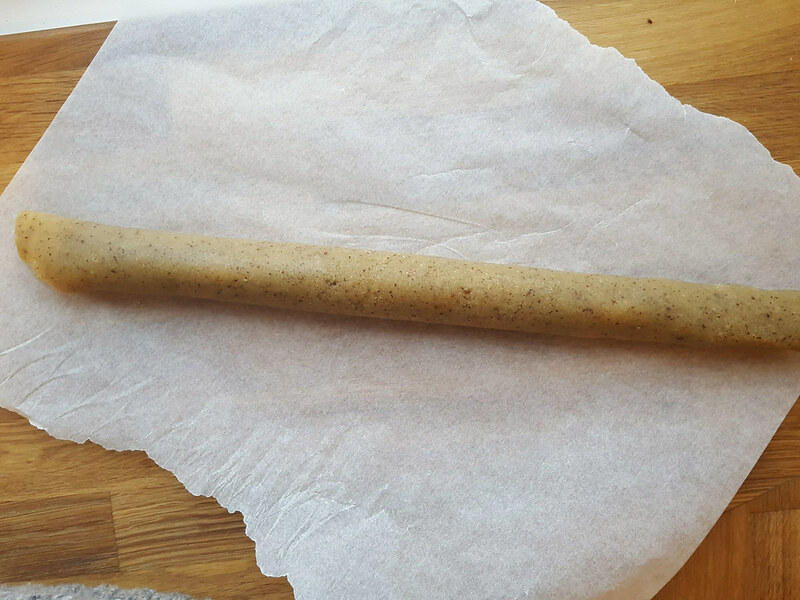 Using a rolling pin to roll out the marzipan in-between two sheet of parchment paper. The marzipan should be a flat and rectangular sheet. The thickness should be about 2-3 mm (1/10 inch). 8. 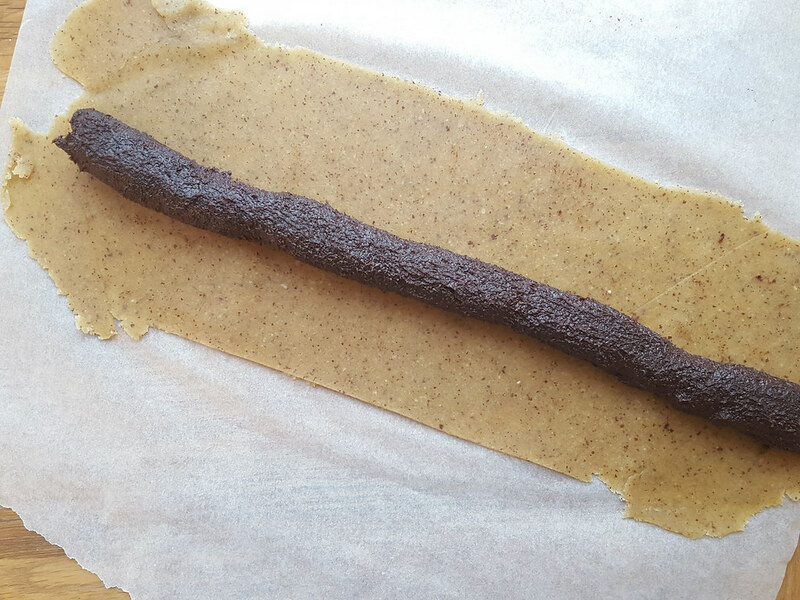 Roll out the cocoa dough into a ‘sausage’ with a diameter of about 2 cm (3/4 inch). 9. 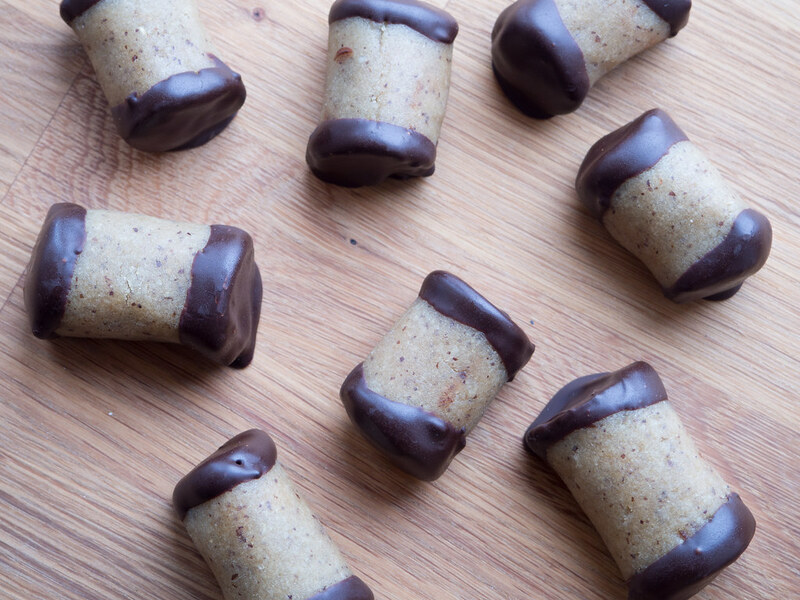 Place the cocoa sausage on the marzipan sheet and wrap the marzipan around. Cut the cocoa covered dough into 4-5 pieces. 10. 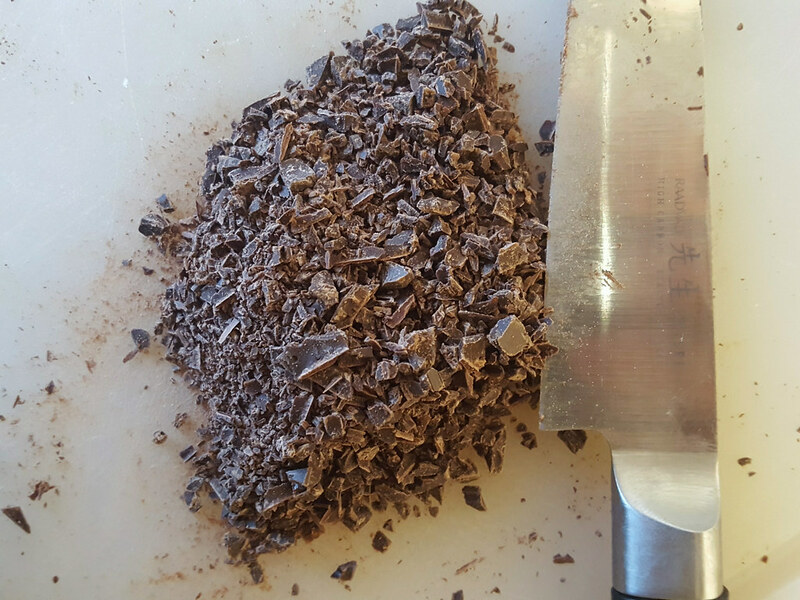 Now it is time to prepare some melted chocolate; The secret to make a great melted chocolate is to first melt half of the chocolate in a water bath and then finally add the rest as coarsely chopped chocolate. How to make a water bath; place a small and heat proof bowl in a saucepan with has a little water in the bottom. Pour in the chocolate and let it slowly melt. Make sure not to get any water into the chocolate. 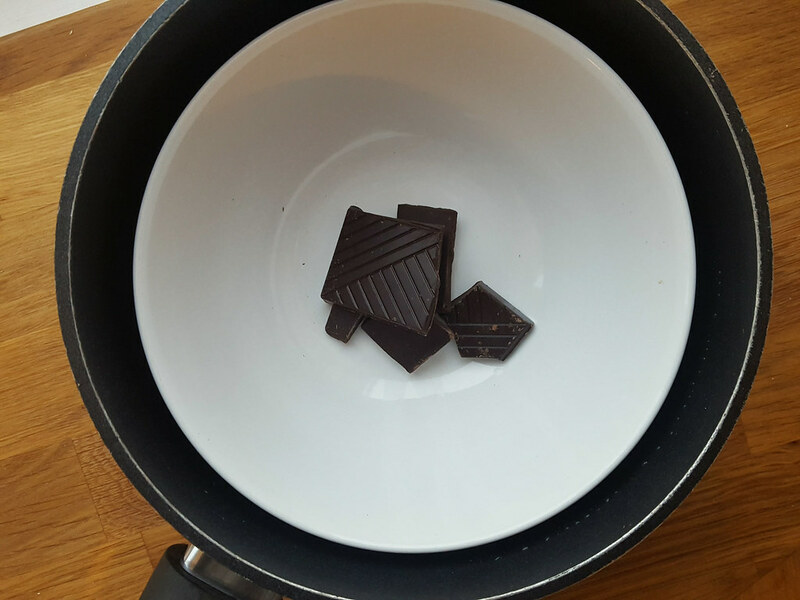 When the chocolate is melted add the rest of the chopped chocolate and stir gently until everything is melted. 11. 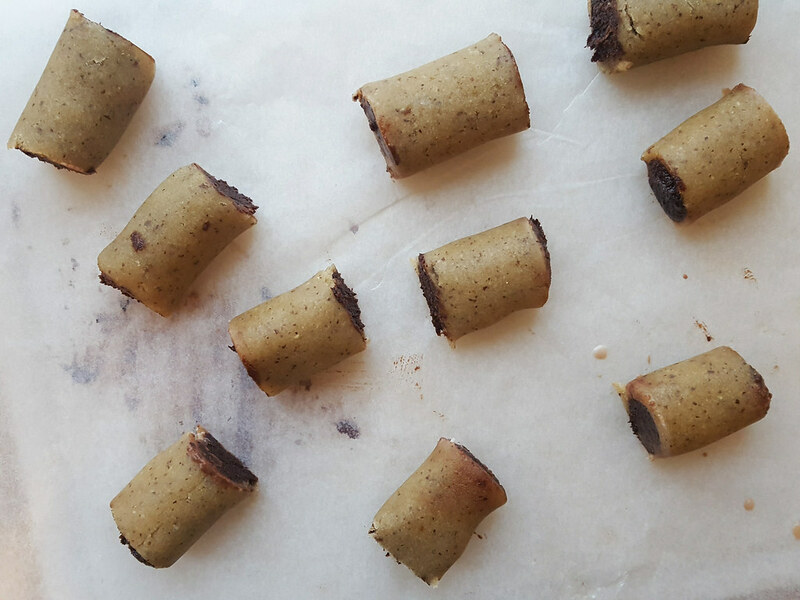 Dip each end of the small cakes in the chocolate and place them on a parchment paper. Let the chocolate dry and let them rest in the fridge for 15 minutes. Keep them in an air tight container. Wow, we LOVE this recipe in my house, it has become a new favorite variation of dammsugare!! (I am more familiar with calling them dammsugare ;) ) Tack så mycket för receptet, Kim! Success! My 6 year-old, 1 year-old, and I gobbled these up! Thank you!!! I’m always looking for recipes like this: healthy versions yet still desserty and delicious.